I’m curious what you all eat for the holidays? Typically our meal is a carb overload. Of course we have the ham (or turkey for Thanksgiving)…but then you have mashed potatoes, sweet potatoes, and hashbrowns. Oh and a basket of No Knead Garlic Parmesan Dinner Rolls is a must too! This Cheesy Hash brown Casserole has been making appearances at family functions since I was young. You know, back when Corn Flakes cereal was like one of only 20 cereal choices. And as children, we liked Corn Flakes! I have to be honest, my kids don’t care for Corn Flakes (they much prefer Frosted Flakes). 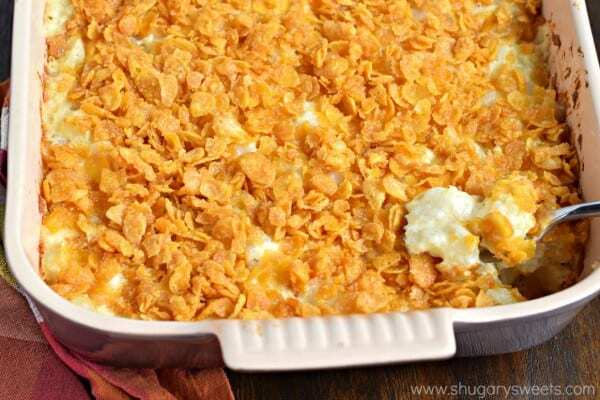 The only time we have a box of Corn Flakes in our pantry is when I know this Cheesy Hashbrown Casserole is going to be on the menu! 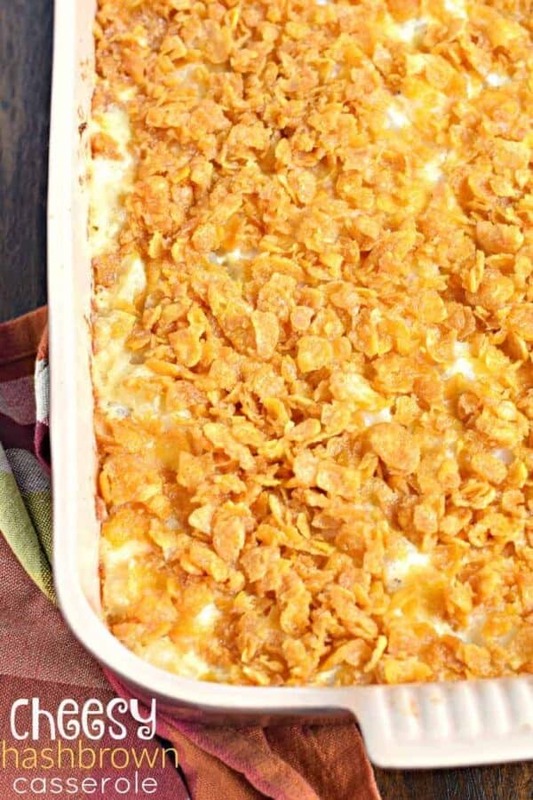 Corn flakes mixed with melted butter are the perfect crunchy, buttery topping for Cheesy Potato Casserole. My mom’s Cheesy Hashbrown Casserole recipe also uses pre-shredded cheddar cheese. You know, the orange stuff in the bag (which we all love of course). However, if you’re looking to take this to the next level of deliciousness, try using Cabot Seriously Sharp Cheddar. It gives this dish such an intense, tangy flavor you can’t resist. And, it melts so creamy mixed up with the rest of the ingredients! Cheesy Hashbrown Casserole is such a great addition to any meal as it can be prepared ahead of time. All you need to do is pop it in the oven when it’s time to cook the meal. I hope you enjoy Cheesy Hash brown Casserole as much as my family does! Whether it’s for Easter or Thanksgiving, it’s the perfect side dish! My family calls this recipe Cheesy Hashbrown Casserole, but I have also heard it called Funeral Potatoes. Why, you ask? If you have ever been to a funeral in the Midwest, you know that these Cheesy Funeral Potatoes almost always make an appearance at the meal afterwards. They’re not just a staple at funerals, though – Funeral Potatoes are a part of just about any potluck or gathering in the Midwest. In a big bowl, you’ll mix everything except for the butter and corn flakes together. It’s okay if your hashbrown potatoes are frozen. My family prefers the “cubed” version, but if you like shredded feel free to use those! Pour into your prepared pan! Crush your corn flakes slightly, you don’t want tiny crumbs here, but you also don’t want all whole flakes either. 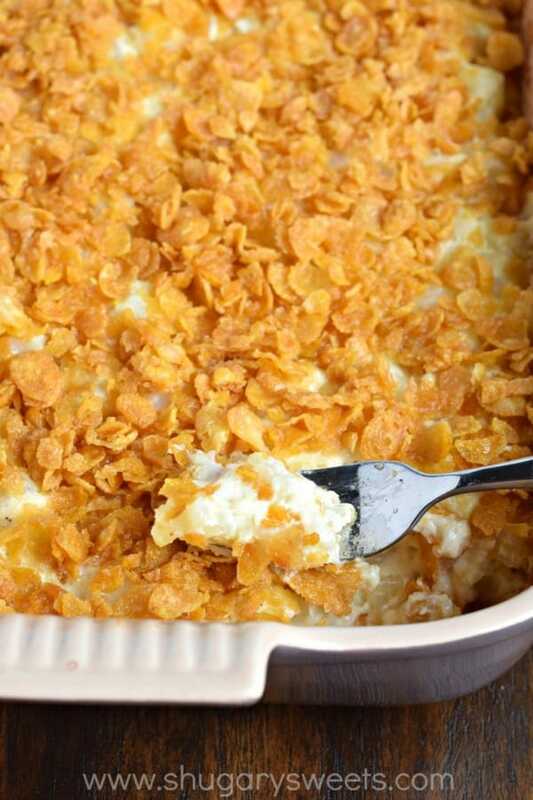 Mix up your corn flakes with the melted butter and sprinkle it over the top of the casserole. You can also substitute potato chips or Ritz crackers for the topping! Cover the Cheesy Hashbrown Casserole with foil and bake until golden brown and bubbly. About one hour. SERVE hot! Cheesy Hashbrown Casserole makes delicious leftovers too, so be sure to save it! 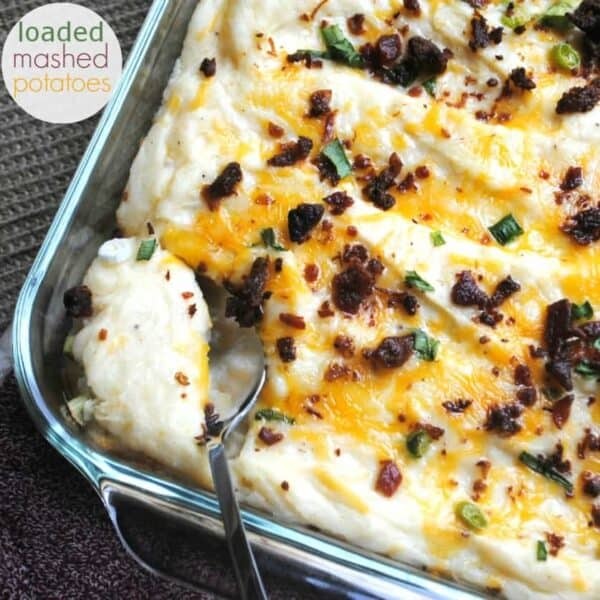 Jill’s Cheating Potatoes: aka loaded mashed potatoes! 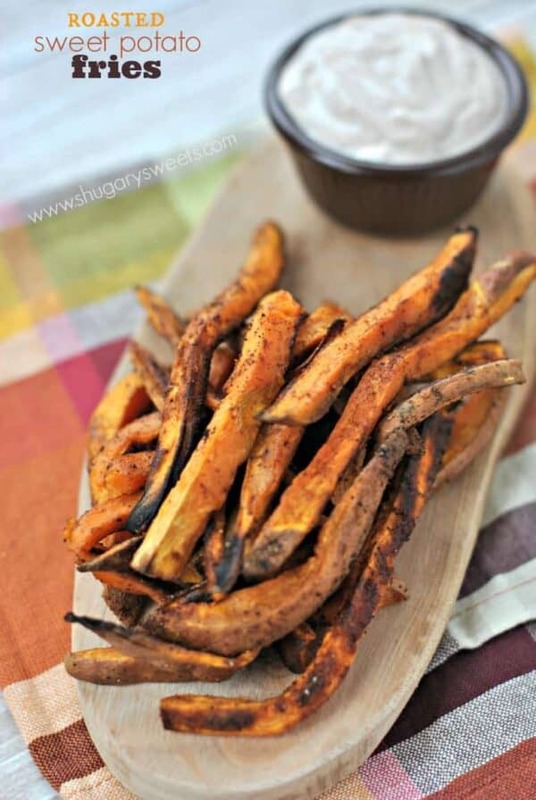 Roasted Sweet Potato Fries with a sweet cinnamon dip! 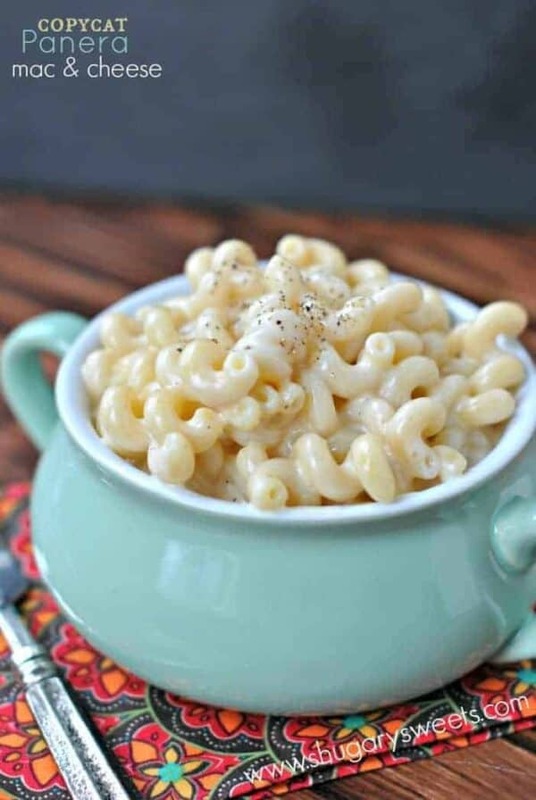 Copycat Panera Macaroni and Cheese: an easy, stovetop side dish that even adults love! This Cheesy Hashbrown Casserole, also known as Cheesy Funeral Potatoes, makes an appearance at all family gatherings. So easy and delicious and perfect for a crowd! In a large mixing bowl, combine frozen hashbrowns, sour cream, cheese, soup, salt, pepper, onion and 1/2 cup of the melted butter. Mix until thoroughly combined. Pour into a 13x9 baking dish. In a small bowl, combine remaining 1/4 cup melted butter with crushed corn flakes. Sprinkle over top of casserole. Cover dish with foil and bake for about 60 minutes. Remove foil and bake an additional 5-10 minutes to add some crunch to the topping. Serve and enjoy! 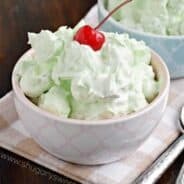 *Recipe originally published on Shugary Sweets on November 11, 2015 and has been updated in November 2018. Looks so good and well balanced in ingredients! Perfectly simple side dish with almost anything! Heart eye emoji! 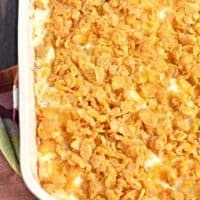 Crunchy, cheesy, casserole of my dreams. Especially since you used sharp cheddar. My family has a very similar version of this recipe, and I posted it this week too, coincidentally! My Grandma found the recipe somewhere, and we’ve been making it for holidays ever since. Love how simple it is, and how ultra-cheesy! It’s definitely a crowd-pleaser. Looks FABULOUS! What?! Hashbrown casserole? This looks insane! I love hashbrowns but have never seen anything like this before 🙂 Yum! How funny, made a dish like this tonight. Recipe quite similar, but, had to do some subs, as the hubs bought the cubed hash browns instead of the grated. Then we had no corn flakes, but I did have corn flake crumbs. So combined 2cups crumbs with 1/4 cup melted butter. Put that on top. Oh, and was too lazy to grate more cheese,so used up the combined cheddar and Monterey Jack had shredded the day before. Was still pretty good and we are all blobbed out from the meal!!!! “blobbed out” LOL. I love recipes that you can just make work with what’s on hand!! Ohmygosh crispy creamy cheesy heaven! I need the entire casserole dish for my face! <3 I love that it's make ahead too! Yum! Nothing quite as comforting as cheese and carbs! This casserole would disappear in a hurry at our house! This is some great comfort food! Yum!!! I love this potato casserole too!!!! This is very similar to the cheesy potatoes we have been making forever too. I just assumed everyone had this recipe, so I have never posted it. LOL! I should know better and just post whatever we eat whenever, right? classic, delicious, indulgent comfort food!!! I’ve never thought about freezing it. Such a great idea, thank you!!! Wow! Maybe these should be called Cheesy Loaded Hash Browns. They look absolutely delicious with everything one would want in a potato casserole. And so easy. I’ve got to try these with our next family get together. Perfect side for holiday brunch! Please do not send me these recips. sugar is poison. This is one of our favorite dishes ever. Loooove making it. These are really yummy! I also like to do mine without the corn flakes. This cheesy hashbrown casserole is some serious comfort food! My family loved it! I’ve never put the corn flakes on top!! can’t wait to try this! Love the corn flakes idea, can’t wait to try your version the next time I make these potatoes. YUM! My favorite side dish for every occasion….we use cornflakes too! 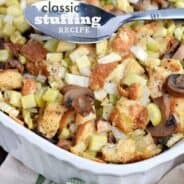 What are your thoughts on mixing and freezing a week in advance? Wow!! Yum. Can you freeze any leftovers? Thanks. ps…mix and freeze a week?! I freeze from Thanksgiving to Christmas or longer every year…..NO PROBLEMS. We use potato O’Brien instead of hash browns. It already has the onion and we love the green peppers too!